David Stockman Lashes Out At Mainstream Media's "Peak Fantasy Time"
If you want to know why both Wall Street and Washington are so delusional about America's baleful economic predicament, just consider this morsel from yesterday's Wall Street Journal on the purportedly awesome November jobs report. Wages rose just 2.5% from a year earlier in November - near the same lackluster pace maintained since late 2015, despite a much lower unemployment rate. But in a positive sign for Americans’ incomes, the average work week increased by about 6 minutes to 34.5 hours in November.... November marked the 86th straight month employers added to payrolls. Six whole minutes added to a work week that has been shrinking for decades owing to the relentlessly deteriorating quality mix of the "jobs" counted by the BLS establishment survey. In fact, even by that dubious measure, the work week is still shorter than it was at the December 2007 pre-crisis peak (33.8) and well below its 2000 peak level. The reason isn't hard to figure: The US economy is generating fewer and fewer goods producing jobs where the work week averages 40.5 hours and weekly pay equates to $58,400 annually and far more bar, hotel and restaurant jobs, where the work week averages just 26.1 hours and weekly pay equates to only $21,000 annually. In other words, the ballyhooed headline averages are essentially meaningless noise because the BLS counts all jobs equal----that is, a 10-hour per week gig at the minimum wage at McDonald's weighs the same as a 45 hour per week (with overtime) job at the Caterpillar plant in Peoria that pays $80,000 annually in wages and benefits. When the line is trending inexorably from the upper left to the lower right, of course, it means there are more of the former and fewer of the latter. Six more minutes of continuing worse----is still bad. As a matter of fact, the November report showed 20.199 million goods-producing jobs in manufacturing, construction and energy/mining, which did represent about a 2% improvement from prior year. The real story, however is not about the short-term monthly or annual deltas being generating by an economy barely crawling forward. Rather, at 102 months, the current business cycle is exceedingly long in the tooth by historic standards (the longest expansion was just 118 months under the far more propitious circumstances of the 1990s). In fact, what has been the weakest expansion in history by far may now be finally running out of gas. During the last several weeks the pace of US treasury payroll tax collections has actually dropped sharply---and it is ultimately Uncle Sam's collection box which gives the most accurate, concurrent reading on the state of the US economy. Some 20 million employers do not tend to send in withholding receipts for the kind of phantom seasonally maladjusted, imputed and trend-modeled jobs which populate the BLS reports. 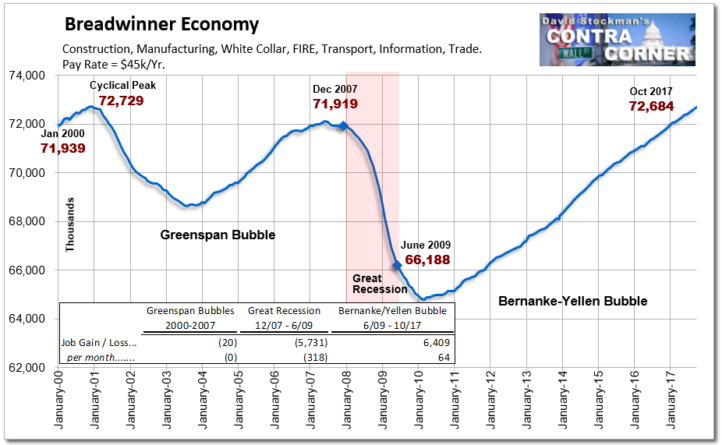 Yet we we are not close to having recovered the 4.3 million goods producing jobs lost in the Great Recession; 40% of them are still AWOL---meaning they are not likely to be recovered before the next recession hits. 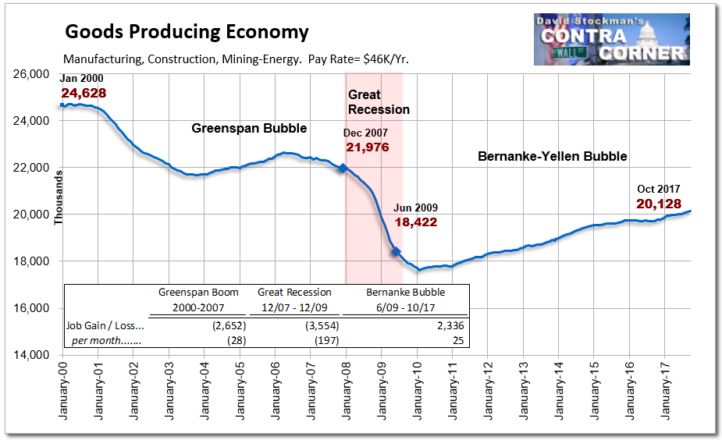 Stated differently, the US economy has been shedding high paying goods producing jobs ever since they peaked at 25 million way back in 1980. Indeed, we are still not even close to the 24.6 million figure which was posted at the turn of the century. 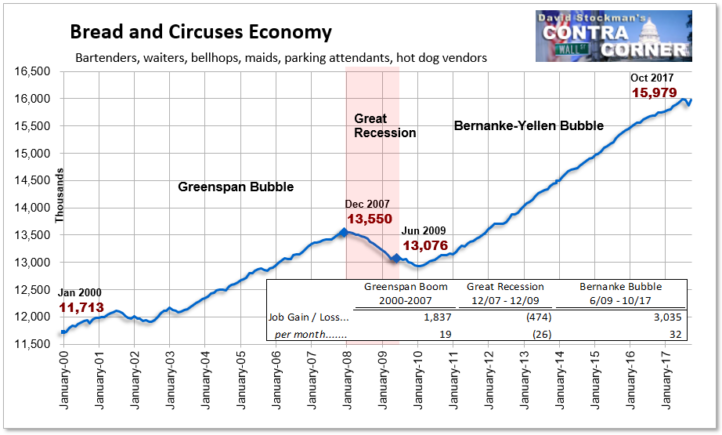 By contrast, the count of leisure and hospitality jobs( bars, hotels and restaurants), or what we have dubbed the "Bread and Circuses Economy" keeps growing steadily, thereby filling up the empty space where good jobs have vacated the BLS headline total. Thus, when goods-producing jobs peaked at 25 million back in 1980, there were only 6.7 million jobs in leisure and hospitality. Today that sector employs 16.0 million part-time, low-pay workers or 2.4X the four decade ago level. Yes, there is nothing wrong with these jobs or the workers who hold them, but the fact that they constitute a rapidly increasing share of the mix is powerful proof that the job market is not nearly as awesome as it is cracked up to be; and that the monthly BLS report is surely no measure at all of a rising standard of living in Flyover America. The larger point is that the monthly jobs report is really neither a report on true labor market conditions or a proxy for genuine economic growth. The fact is, without sustained growth of full-time, full-pay "breadwinner" jobs there is no real economic recovery or progress. And we literally mean, no progress. With an update for November's results, the chart below would show 72.8 million "breadwinner jobs" in goods production, the white collar professions, business management and support, transportation and distribution, FIRE (finance insurance and real estate) and full-time government jobs outside of schools. As it happens, that is virtually the same number posted by the BLS back in January 2001 when Bill Clinton was packing his bags to vacate the Oval office. In short, three presidents later---all of whom have claimed undying devotion to good jobs and rising living standards---and there is hardly a single new breadwinner job. The above chart does not bring the concept of awesome to mind. In fact, it reminds of the same kind of stagnation that is evident in all the key metrics for real economic progress. For instance, an economy flat-out can not grow without steady gains in industrial production, which includes energy extraction and all facets of goods manufacturing from automobiles to furniture clothes, shoes and canned soup. But like in the case of "breadwinner jobs", this so-called recovery has generated none of it. The index of industrial production stands at exactly the level of the pre-crisis peak a full decade ago. There is a whole raft of these statistics, but the following graph leaves little to the imagination. Notwithstanding the Fed's whacko claim that it hasn't generated enough inflation in recent years, the truth is that even by the BLS' faulty measuring stick every single dollar of median household income gain has been eaten up by CPI inflation. Accordingly, there has been zero gain in real median household income for the entirety of this century! What does our latest Oval Office occupant plan to do about this? Why nothing less than borrow $1.8 trillion from future taxpayers in order to enable corporations and other business to crank-out even bigger financial engineering distributions to shareholders in the form of dividends, stock buybacks and M&A deals. This isn't even "disruption" as per the Donald's real job. It's just dumb and fiscally irresponsible beyond measure - a message we have once again taken to the mainstream media in recent days.